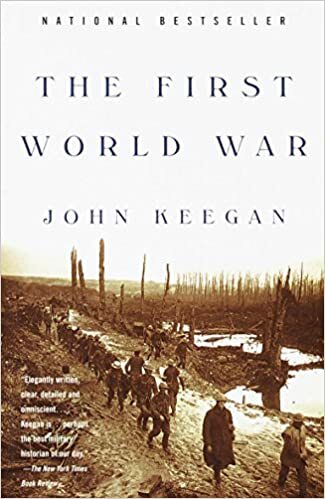 I recently finished John Keegan’s The First World War, available from the Amazon machine here. I received this book from my father in law a number of years ago and it finally made it through my system of book reading. I found it an excellent read. The thing I appreciated the most out of Keegan’s book, other than a rare mention of the United States throughout, the US military does not enter the book until about page 400 and the book is only 427 pages long. This is not an effort to insult the American folks who suffered and died in the war, but it accurately shows who really bled and won the war. Russia, England, and France, with smaller bouts from Belgium, Italy, and many others. I have spent a lifetime hearing how the US saved the world (twice) from speaking German and this is a total and complete misrepresentation of reality. Germany could not even cross the English Channel, how would they cross the Atlantic? Not to mention all of the involved parties were bled dry by the time the US entered the war and would have sued for peace had the US never gotten involved. Anyways, why would a pastor recommend this book? There is a major effort in trying to evangelize Europe and its roughly 800 million people. The http://www.imb.org says 99% of Europeans do not have a personal relationship with Jesus. There is a huge need in Europe for missionaries to reach the continent and many ways to do so. There are currently 13 short-term missions to European countries available for review here. The world is a large place. As Christians, we need to develop a greater understanding of the world, not only in our neighborhood, but much further abroad. Think of it as our command to evangelize in Jerusalem, Judea and Samaria, and to the ends of the world. Studying foreign cultures is our effort to greater understand the past and history of other parts of the world so we can understand why in 2019, the IMB would declare 99% of an area that had previously been the bedrock of Christianity, bereft of faith in Jesus. If you expect Keegan to discuss Christianity and faith in The First World War, you will not find it. But we must understand how European’s have been impacted by having their entire world destroyed, twice, and how it has impacted their faith since. I recommend this book to enhance your mind and understanding of a people that have largely turned their backs on the God of their youth since.